He just did, and acknowledged being a bit overwhelmed to be in charge of the House That Wooden Built. “But trust me, I’m prepared,” he told a bevy of former UCLA players and boosters during a news conference Wednesday at Pauley Pavilion. 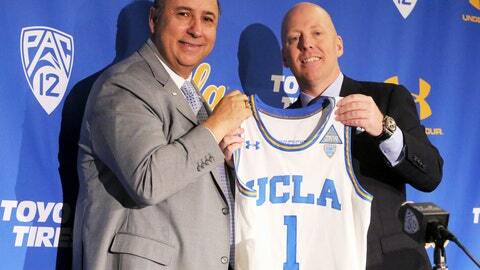 Athletic director Dan Guerrero presented Cronin with a UCLA jersey with No. 1 and his name on the back. Cronin turned the jersey from back to front for photographers, saying, “The four letters are more important than my name,” which drew applause from the assembled crowd. Cronin cracked a few jokes, mentioned John Wooden’s name early and often, and insisted he didn’t get caught up in the school’s bumpy coaching search that lasted just over three months. “I was dealt with nothing but honesty the entire time,” he said. Guerrero said Cronin was on the search committee’s radar from the start. The Bruins won 10 national championships under Wooden, including seven in a row. They’ve won one more since the Wooden days, but that was in 1995. Myers recalled that during his four-year career the Bruins won the conference title three times and made an Elite Eight appearance. Myers joined several former Bruins for Cronin’s introduction, including Jamaal Wilkes and Mike Warren, who both played for Wooden, along with Tracy Murray, Kris Johnson and Sean Farnham. Former Bearcats players Kenyon Martin and Ron Allen were there, too. Cronin’s father, Hep, looked on from a seat beside the divorced coach’s 12-year-old daughter, Samantha, and longtime girlfriend Christine. Cronin agreed to a $24.5 million, six-year deal. His contract includes up to $300,000 in team and academic bonuses. It has a reciprocal buyout of $19 million if either side wants out before March 31, 2020. The buyout is reduced in subsequent years. Cronin replaces Steve Alford, who was fired Dec. 31 after 5 ½ years. Alford won one Pac-12 tournament title but never a regular-season league title, and made four NCAA Tournament appearances, including Sweet 16 berths in his first two years. Alford’s perceived aloofness didn’t play well among boosters, and some felt he didn’t embrace Wooden’s legacy enough. Cronin can be downright fiery at times. Cronin rarely gave an indication that he would leave his hometown of Cincinnati, where he guided the Bearcats to nine straight NCAA Tournament appearances, but only once made it past the second round in 13 years. Cronin met briefly with the current roster of Bruins, although he won’t have sophomores Kris Wilkes and Jaylen Hands, both of whom plan to hire agents and declare for the NBA draft. He takes over a team that went 17-16, including 9-9 in the Pac-12, and missed the NCAA Tournament a year after losing in the First Four. He has yet to finalize his new staff, although he said Darren Savino would join him in Westwood if the associate head coach doesn’t get promoted to the Bearcats’ top job. Cronin lingered after his news conference, greeting and chatting up everyone who stuck out a hand. His message resonated with a crowd that has seen attendance drop and interest flat-line in a program that owns a record 11 national championships.